AmeriGlide Stair Lifts are proudly made in the USA! Limit switch not explained - Warrantee less than discussed. kdf-engineer from Stairway to basement in parents house would recommend this to a friend. 1. Discovered requirement to lubricate tracks. Not sure how I can do this as I do not live near parents. May not be as low maintenance as advertised. 2. Upon powering up lift, it did not move. Discovered that lower limit switch was pre-installed on upper track (2 ft). This should have been highlighted in instructions. "Lower limit switch comes installed on top rail. It must be repositioned before lift can descend. Arrow points to limit switch in diagram." I was originally planning to purchase the Ameriglide lift, but there was a special promotion on the Summit and it was reputed to be a better lift (350# vs 300# limit). However, the Ameriglide has a 10 year warranty and the Summit is listed as only a 5 year warranty. As such, I would consider the above claim that, "Summit Stair Lifts have some of the longest warranties in the industry" to be false. This reduction in warranty was never revealed to me prior to purchase, and I consider this misleading. Thank you for your review. We apologize that the warranty difference was not clearly explained to you. Summit does offer a great warranty compared to most other brands in the industry, but the warranty isn't as good as AmeriGlide's. Rudy from North Canton, Ohio would recommend this to a friend. 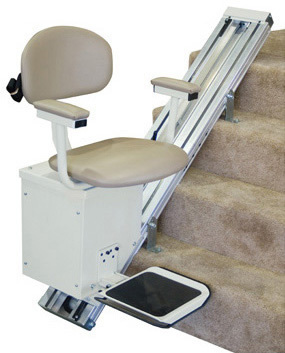 I purchased this stair lift for an elderly member of my family. It was easy to install and the price was reasonable, so they could afford it. Property and Finance Committee from Battle Creek, Michigan would recommend this to a friend. This was a stair lift chair to aid our church members from one level to another. There were 6 steps and was a real problem for 4 people. Thanks for such a wonderful product. Steven (Popeye) from Parsonsburg, MD would recommend this to a friend. Elderly caregiver with a bad heart. Sturdy, helpful, safe, and excellent. This is a excellent product. This stair chair lift was very easy to install. The only problem I had was getting to the nuts to level the unit. They are between the unit and the wall. They are very difficult to get to, you have to have a long handle, with a 3/8th open end wrench, but I overall really love the unit it looks great and is great getting up and down the stairs. I thank you for all your help, a great chair lift and a great price. - Thanks again, Steve. Really do Love my Chair lift. Tangotrudy used to be dancer. from Virginia Beach, Virginia would recommend this to a friend. When your legs go the chair lift is the way to go.Especially handy for one who has to use a cane to get up and down the stairs. Nice quiet ride. I personally don't have any complaints whatsoever. Thanks for a wonderful product. Easy to install and it works great. Mr. Ron from Pasadena, Tx. would recommend this to a friend. We only used the lift for two weeks and the user passed on we have disassembled and are attempting to sell the lift. AmeriGlide Stair Lift was a life save. Woody the poker player. from Shalimar, FL would recommend this to a friend. The stair lift, prevented me from having to move downstairs. Wonderful item for our handicap members. Ms. Judy from Southwest, VA would recommend this to a friend. Helps them get up the stairs, with ease. jbart2505a from Houston Texas would recommend this to a friend. After 6 months in the hospital, I knew it would be a major effort to get my partner up and down 18 feet of stairs. This chair lift made it possible. Caregiver from Columbus, Ohio would recommend this to a friend. Very good product. Helpful in transporting husband down outside stairs. Provides peace of mind in knowing that he will not be walking down icy steps. This allows his mobility and the opportunity to go outdoors.